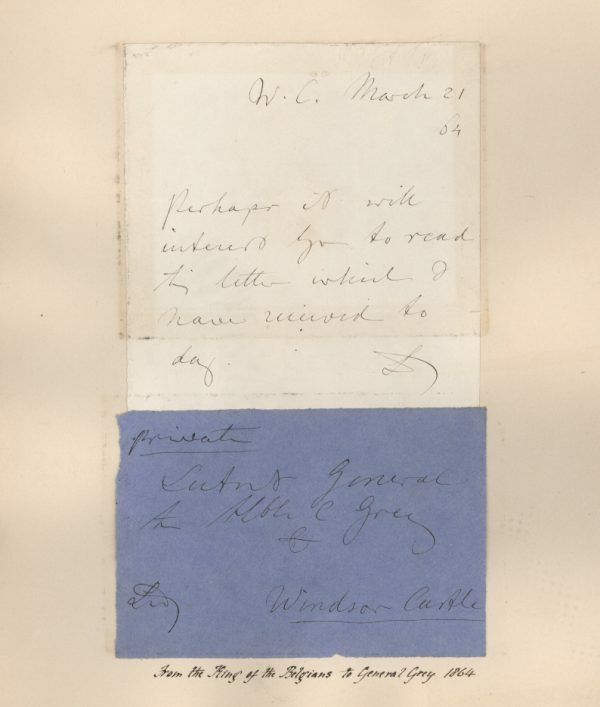 Autograph Note signed with initials, to General Grey, Windsor Castle, sending a letter which he has received. Mounted with the original Autograph Envelope Front, also signed by initials, for local delivery within the Castle. Both items 8 x 5 inches, neatly mounted on an old album page. Windsor Castle, 21 March 1864. Leopold I (1790 – 1865) was the first King of the Belgians (from 1831), following Belgium’s independence from the Netherlands. He was the founder of the Belgian line of the House of Saxe-Coburg and Gotha. His children included Leopold II of Belgium and Carlota of Mexico, Empress-Consort of Maximilian I of Mexico. He was a maternal uncle and adviser of Queen Victoria.